To make into a main dish, add nuts, cheese or chopped chicken. 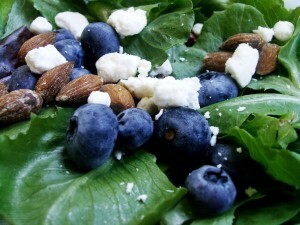 Combine blueberries, greens and onion in a large bowl. In a small bowl, whisk together lime juice, oil, and honey. Add salt and pepper to taste. Pour half of the dressing over salad and toss together. Taste. Add more dressing as needed.